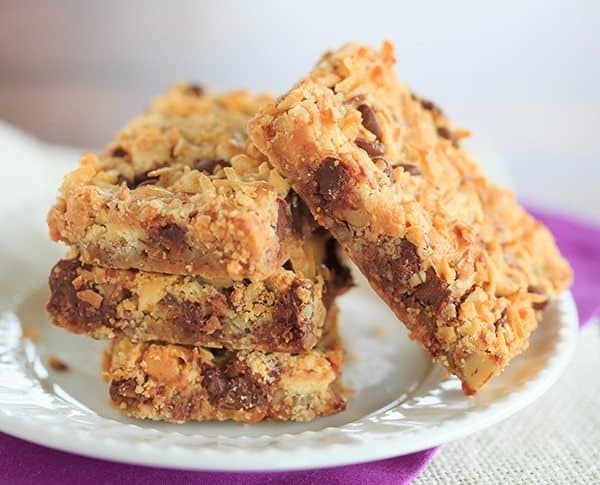 Seven Layer Bars, aka Magic Bars – Seven glorious layers of graham crackers, nuts, chocolate chips, white chocolate chips, butterscotch chips, coconut and sweetened condensed milk! 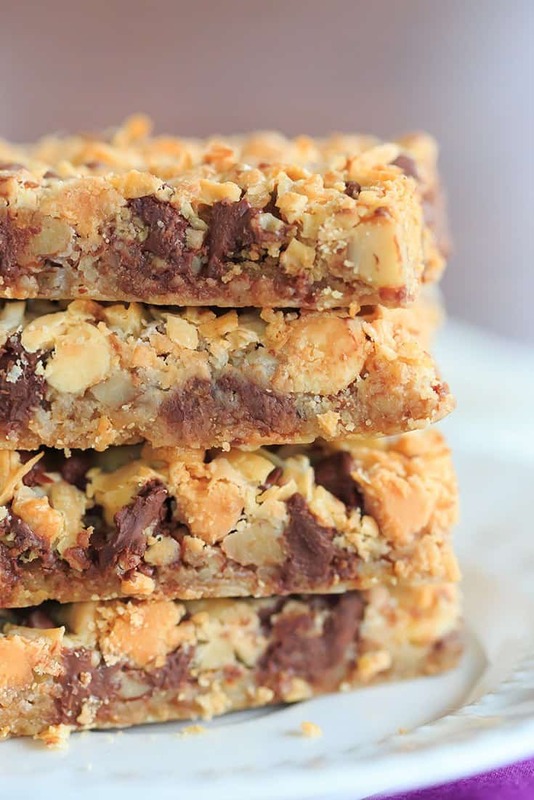 Seven Layer Bars, also known as Magic Bars, have a graham cracker crumb base and are topped with a combination of nuts, chocolate chips, white chocolate, butterscotch and coconut, and held together by sweetened condensed milk. In other words: Sweet. Rich. Delicious. Grab a tall glass of milk and get your oven ready! This recipe requires very few ingredients and a minimal amount of steps, which means that it can be thrown together in no time at all. If you keep an assortment of chips and coconut in your pantry, you could whip these up any time the mood strikes. 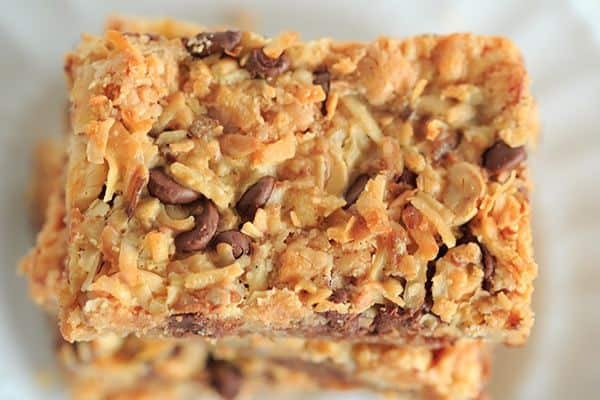 I love that the sweetened condensed milk holds these bars together so well and that you get a mouthful of chips, nuts and toasted coconut in every single bite. SO good. 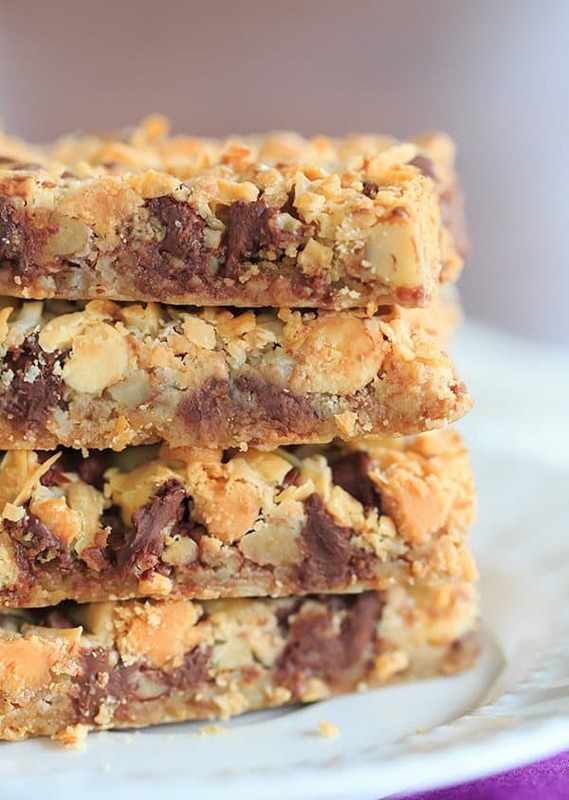 Earlier this summer, I attempted to recreate a version of a chocolate caramel bar that is sold at a nearby bakery… if you can’t get enough of seven layer bars, then check out those ultimate magic bars. Seven glorious layers of graham crackers, nuts, chocolate chips, white chocolate chips, butterscotch chips, coconut and sweetened condensed milk! Adjust an oven rack to the lower-middle position and preheat to 350 degrees F. Spray a 9x13-inch baking pan with non-stick spray. Line the pan with two overlapping pieces of foil or parchment paper, leaving the overhang to act as handles for lifting the bars out of the pan. Spray with non-stick spray. Combine the melted butter and graham cracker crumbs in a small bowl. Toss with your fingers until the butter is evenly distributed. Spread the crumbs evenly over the bottom of the prepared pan (this is not meant to be a crust, so you don't need to press it flat and there will be some small bare spots along the bottom, that's okay). In this order, sprinkle the pecans, chocolate chips, white chocolate chips, butterscotch chips, and coconut over the graham crumbs. Pour the condensed milk evenly over the entire dish. Bake until the top is golden brown, about 25 minutes. Cool in the pan on a wire rack to room temperature, about 2 hours. Remove the bars from the pan using the foil or parchment handles and transfer to a cutting board. Using a sharp knife or bench cutter, cut into 2 by 3-inch bars. These were so delicious. Big hit in our house! Had this at work…great. What do you think about using cookie dough instead of graham crackers? I thought this recipe was so good that it merited a placard. Follow the website link to copy the image. 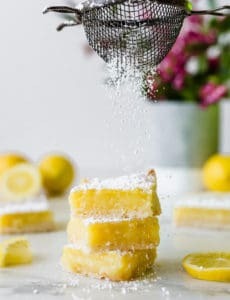 There’s a reason this recipe’s a classic: it’s irresistable! I’ve made two batches, and they’ve been eagerly gobbled up by the groups I served them two. Following the suggestions of other commenters, I used PB chips instead of butterscotch. I also used unsweetened coconut flakes; the sweetened, condensed milk is plenty sweet enough. For a final tweak, I used cinnamon graham crackers. 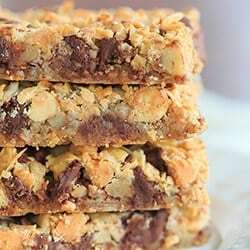 Can 7 layer bars be frozen? Hi Mary, Yes, they can! Actually made these for a friend and they continually raved about them. I am gifting these for Christmas in a nice Tin Box! These bars look delicious but I am not a coconut fan..can I leave the coconut out or replace it with something else? Hi Susan, Coconut is a pretty big piece, I don’t think you can just omit it – I would recommend replacing it with something else. This is uncanny – I was just searching on your site last NIGHT for these bars, and couldn’t figure out why the URL wasn’t working! 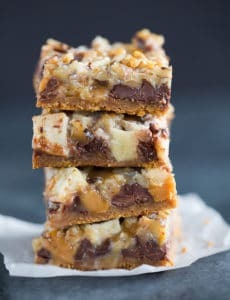 My students just requested these for the last day of class – I’m not a fan of butterscotch, so will use PB chips instead – have you made that substitution? Hi Sally, I haven’t, but I can’t imagine that it wouldn’t be delicious! 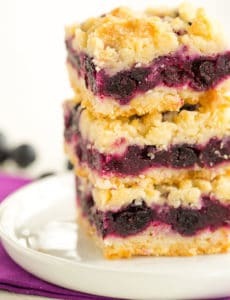 These are the prettiest Seven-Layer Bars I’ve ever seen! We love these and I often forget about them. Thanks for the reminder. Check out this cherry version, so similar but a very different flavor! These cookies are great for teaching kids about baking. No eggs (you have to try all the ingredients while baking..right? ), no electric mixers needed and easy to can up. My then-3 year old loved the sense of accomplishment when she ‘made’ them by herself. Yes, they weren’t as pretty as yours but the smile was worth it! I love the idea of a baking bucket list, I’m gonna have to pinch that idea! These look amazing! Right up my street!! Yum! Looks delicious, can’t wait to try! Many thanks for the recipe as well as the pictures. I just made the bars and baked them for about 30 minutes but they are not brown on the top! I sure hope they turn out okay, will let you know. I’m taking them to a potluck tomorrow (maybe). Again, thanks for the recipes. Oh yes, my oven has the correct temperature. Any suggestions? Should I have left them in longer? Is there anything I can substitute for the coconut? Thanks! Hi Susan, You can omit the coconut or replace it with another ingredient of your choice. These were awesome. At first I was hesitant to pour an entire 14oz can of condensed sweetened milk on this!! So my first batch I only used about 1/2 the can–7oz instead. They turned out just fine too. But I also made one batch with all 14 oz and they were held together better but the flavors were still the same–very delicious! Warning–!!! Wax paper is not the same as parchment. Even if you spray wax paper these bars still get stuck! I waited until they cooled and then flipped then out right side down. It was much easier to peel off the wax paper! Next time spring for real parchment paper for the nonstick! I made these as well, and the graham cracker base was soggy for me, too. Is there way around that? They tasted very good (but also very sweet). Thank you! Hi Kate, You might try using less butter if you found the base to be too soggy.